Its main activity over the years, and since the seventeenth century, has been the wine industry. The Quinta has always been maintained within the same family and would undergo a renewal in the twentieth century, initially by the hands of Artur de Menezes Corrêa de Sá, and later by his eldest son, José de Menezes Corrêa de Sá. And thus come the first wireframed vines and with compasses that allow the mechanization of works, first with animal-drawn implements and then mechanical, and later using air assets in the treatments being this way considered as a pioneer in some practices. In the 50’s it underwent a full cellar renovation that allowed the launch of wines with Plátano brand in the 60’s. 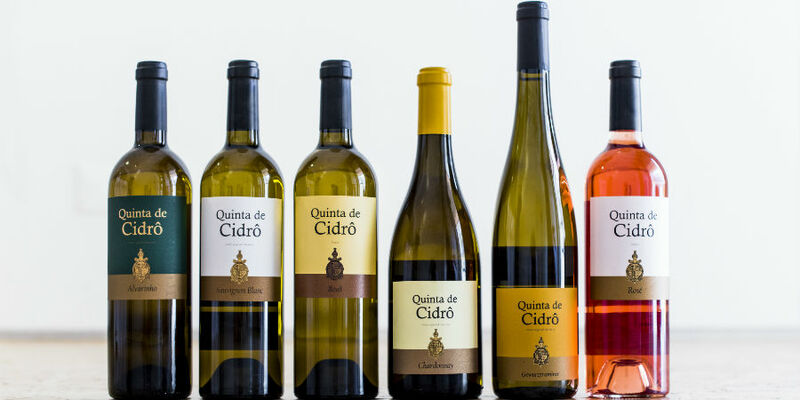 Only later with the creation of the demarcated region were the wines rebranded to Quinta dos Plátanos. In the last years the vineyards have been being restructured, with 16 hectares including Touriga Nacional, Touriga Franca, Tinta Roriz, Syrah and Cabernet Sauvignon. 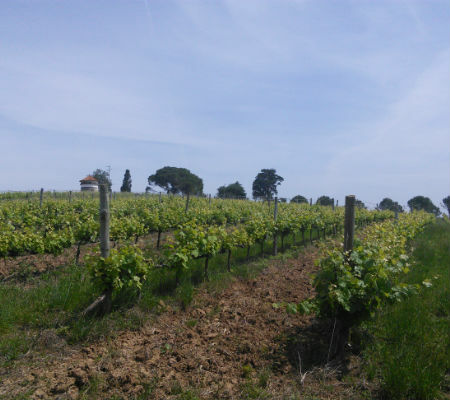 In total there are 35 hectares of vines with white grape varieties such as Arinto and Fernão Pires and red grape varieties such as the Pinot Noir, Castelão and Alicante Bouschet, in addition to the above. Nowadays it’s Arthur Corrêa de Sá and his daughter Luísa who manage the Quinta dos Plátanos. 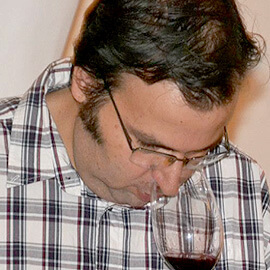 The oenology is in charge of Jorge Páscoa, although when tasting the wines there’s clear distinction between the ranges, there’s a line that separates the range Quinta dos Plátanos from the Plátanos. This distinction is due to Luísa’s husband, the producer Joaquim Arnaud. While the first wines show the more classical side and say, the more rustic side of the region, the Plátanos wines show up in the most elegant side as is the hallmark of the Arundel lineage (Pavia). A place that oozes history, full of fantastic places, which in my opinion is still waiting for a wine that matches its full potential, and I might add that from what I tasted seems to be on the right track but still with some distance to go. 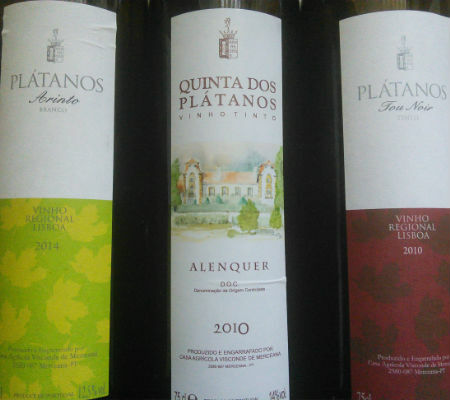 Both Quinta dos Plátanos are DOC Alenquer, the 2014 red and the white, also from 2014. The red shows up with breed, lots of ripe black fruit, freshness well present with a somewhat vegetal brake that provides it toughness and hardiness. In the mouth it shows fruit, fleshy fruit in medium body, it’s tasty and has a good freshness. The white gets its charms from the Arinto and Fernão Pires grape varieties, with great freshness, aromas with some sharpness, very citrus and some orchard fruit, flowers and lemon candy at the end. Mouth to match, fresh, inviting and appealing to the table in hot weather. In the Plátanos range two wines were tasted, the Plátanos Arinto 2014, with grape variety well present in the lemon leaf aromas, lime and lemon, great freshness, tense and with a slight floral somewhat shy in the background, a good example of the variety although it lacks greater angularity on the mouth tasting. The Plátano Tou Noir 2010 is a blend of Touriga Nacional and Pinot Noir, shows up fresh and very appealing, with a beautiful ability to go changing in the glass and adjusting over time. It becomes sweet tooth, fresh and terribly gastronomic with those veal chunks in coal accompanied with garlic butter. A lot of ripe and juicy forest fruit, fleshy and tasty, full of spices, a lot of guts while sweet tooth runs through the palate, all of it packed by a nice freshness that at no time lets it wilt. Let’s take a jump to the Douro Superior, to Freixo do Numão where Dona Berta‘s wine cellar is based. For years this wine’s brand image was the charismatic producer who I remember with longing, Eng. Hernâni Verdelho. It was with him that I first met the Rabigato grape variety of which he was a great supporter. I got to know his wines full of character, both the reds and whites. The conversations used to last for hours, always in a good mood and with a charisma that he was able to convey to his wines in a way that few are. It was interesting to notice that the roughness and the sometimes more rustic touch that sometimes insisted on showing up at first, seemed to sag and bow at the feet of Engº Verdelho. Going back to the tastings and the contact with the new vintages, the wines miss their creator, but the lines that define them are present. His heirs continued the project, and ensured to make last the dream of a man, which nonetheless continues to be powered by the fantastic old vineyard from where are born the different references of the wine cellar. These are wines that need time in bottle, whose well-marked character changes depending on the vintage year. That’s the way of being that I seek and like in a wine. A wine that can transmit to us the way of being of a given year, a wine that is not the same year after year as if it were a product made in series. 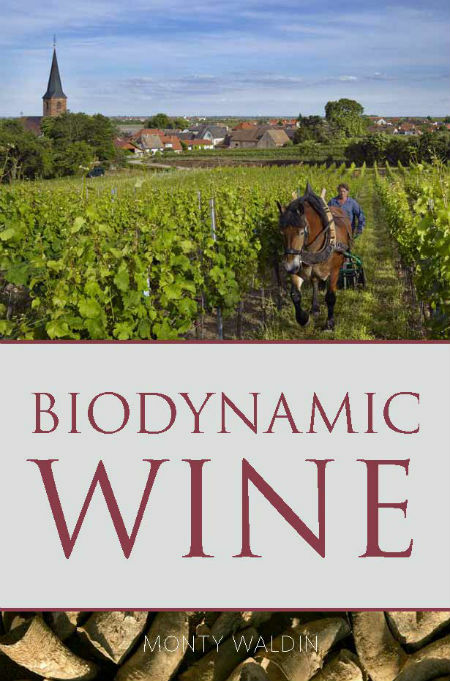 Those of which I speak now are wines with aging potential that were wisely educated and prepared for life by the winemaker and professor Virgílio Loureiro. Thus, do not be surprised that after ten years both the reds and whites show an enviable health. This tasting had two moments. 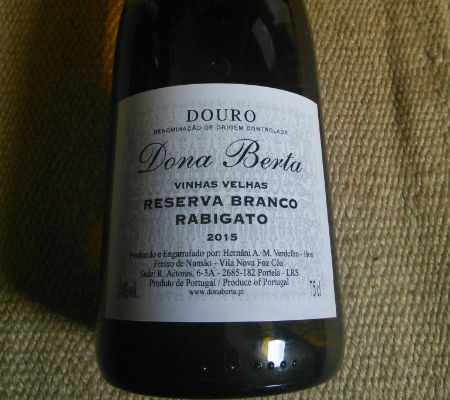 The first moment was with the wine Dona Berta Vinhas Velhas Reserva white 2015, a wine with 100% Rabigato full of freshness. The wine has no longer the intense and fruity aromas that somehow made us guess the grape variety immediately, now shows up more tense and mineral. Very good freshness with well-cohesive and present fruit, and with no exaggeration for that is a thing that was never part of the party here. Tense and nerve in the mouth, good dryness in the well-structured background’s body. It has everything to evolve favorably as time goes by. For now, asks for fish/shellfish dishes with good seasoning because the structure that it shows gives it that clashing ability. Grilled fish in coal will also make a nice matching. 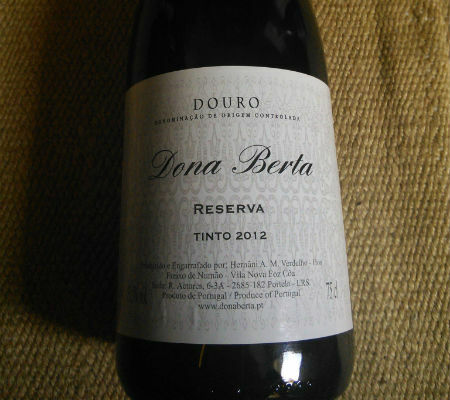 The second moment was with the Dona Berta Reserva red 2012, where once again the red takes its time to enter the market. Lots of character in a wine with power and full of energy, a lot of fruit (berries and forest fruits) but also a slight austerity in the flavor confirmed on the palate. 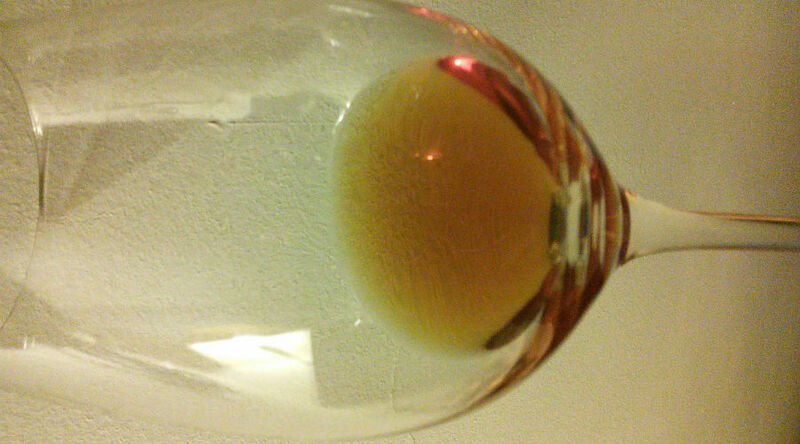 All very compact and well-cohesive, so tight that only with time will we be able to better unveil the aromas. For now it is a red full of life and energy, able to make an outstanding company to a rump steak on charcoal with alioli sauce. 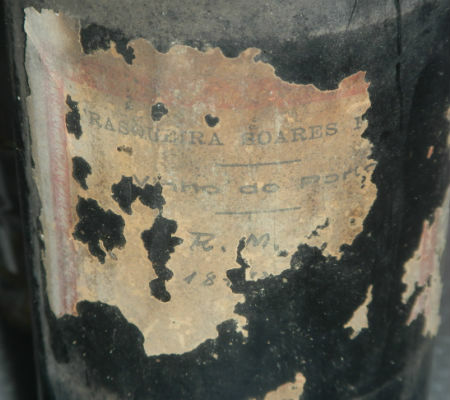 This white wine comes from the Sociedade Agrícola de Mortágua (Agricultural Society of Mortágua) and was produced at Quinta da Gândara, founded in 1756. 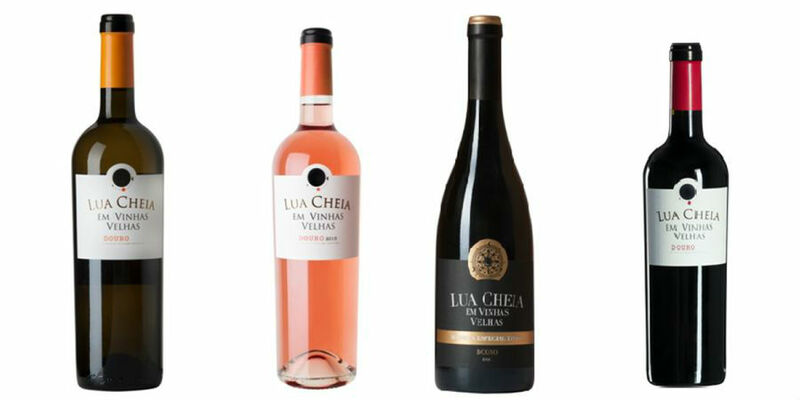 From the granitic soils through the mountains of Caramulo and Bussaco are born the grapes that give place to the two wines now tasted, a white from the grape variety Encruzado and a Touriga Nacional red. Lacking more detailed and accurate information, I just want to register that these wines are part of Caves da Mantanha’s (Bairrada) “squad”. These are wines that fall under a profile that does not turn its back to the region, however, it is noticeable that everything is done in a more modern way and to the image of our days. It’s not that that’s bad sign, these are just signs that the region has known how to evolve and reposition itself in order to meet the demands of the market and new consumers. A sign of this are the more modern wines. Wines that are more ready to drink and with more honed tannins where the aging and life in the bottle are often left aside. We are therefore faced with the immediate pleasure and we lose that keeping potential that gave so much fame to regions, such as the Dão. The question is whether this is the way forward or if it was just a shortcut that was chosen seeking early success. Both wines bear the designation Reserva. The aging was made in new French oak and lasted seven months for the white and ten months for the red. The Quinta da Gândara Reserva Encruzado 2013 has a rich aroma, is ample with a clear presence of wood entangled in ripe fruit, and has some dried fruit pointing to an precocious evolution. The rest of the set is fresh, medium-sized, with a mineral clipping background reminding flintlock, vanilla. A medium weight profile with good dose of freshness. On the palate combines ripe fruit with lemon pie notes, it’s ample and with final dryness. 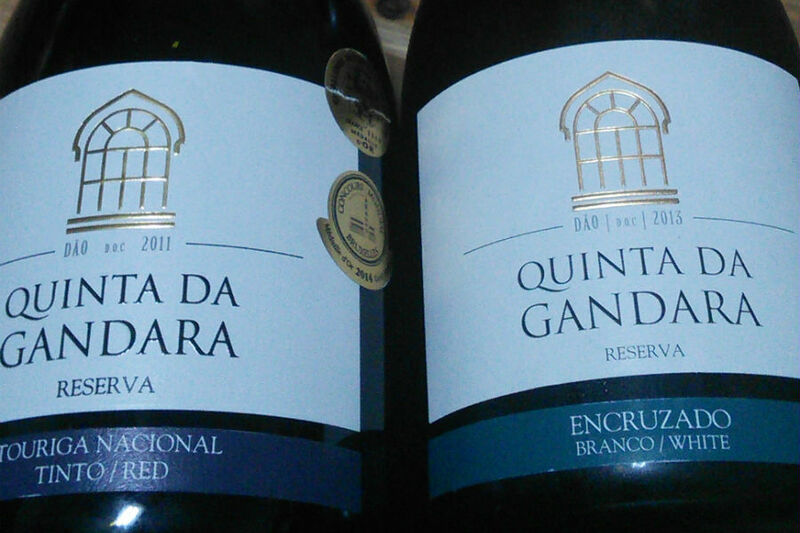 The Quinta da Gândara Touriga Nacional Reserva 2011 is the opposite of the white. Its aromas immediately take us to the Dão. The set has a good freshness showing a fresh and mature Touriga Nacional, floral, orange peel with a slight tip of austerity and exuberance. All packaged in a sweet tooth tone with notes of cocoa, spices, forest fruits jam, wrapped in freshness with cohesive mouth, a lot of energy with austerity in the background, fleshy and full of flavor. Joaquim Arnaud is a name that has been around since 1883 and that has been passed on from generation to generation as tradition. He’s a descendent from an Alentejo family, from Pavia, documented there since 1515. A family that has always been dedicated to mounted, olive groves, vineyards, cereal cultivation and livestock (pigs, cows, sheep and horses). Their properties are located in the municipalities of Mora and Arraiolos, in the Évora district. In 2010, in order to maximize these resources, Joaquim Arnaud decided to create his custom brand, to which he gave his own name. His business goal is based on bringing to the market selected products with short runs, in which he combines the artisanal with sophistication. This is how producer Joaquim Arnaud presents himself, the wines that he creates in his cellar speak for themselves. In this tasting I only focused myself on the wines coming from Alentejo, more properly Pavia. 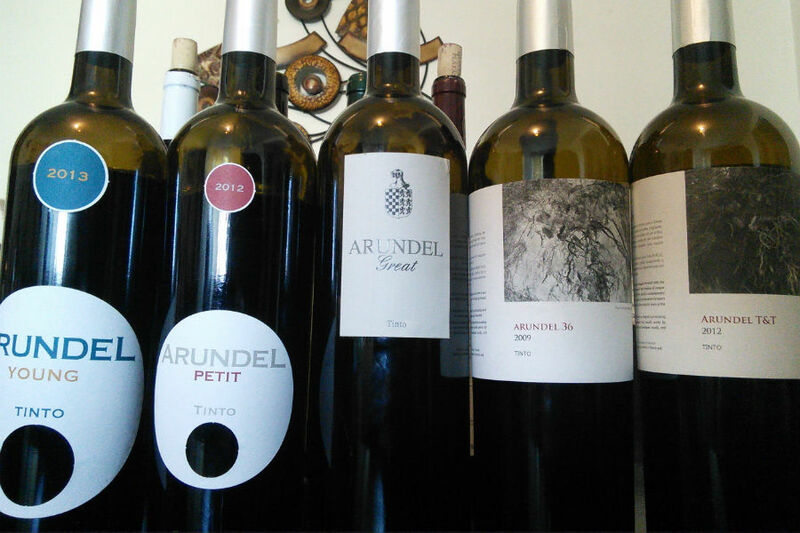 Arundel Young 2013 and Arundel Petit 2012 are the example of youth and the fruit’s strength, both with a dose of austerity providing a very good energy to the set. Both share the same blend comprising of Aragonez, Syrah, Trincadeira and Alicante Bouschet, varying only in the time spent aging in barrel, 6 months for the Young and 9 months for the Petit. Wine with a fleshy profile, dense, with the Alentejo marking its presence with a quality bouquet emanating notes of plum, blackberries, spices and jam. Good freshness and purity of aromas in a conquering and breathtaking set. Wines asking for food nearby, grilled meats are the perfect match at this time. 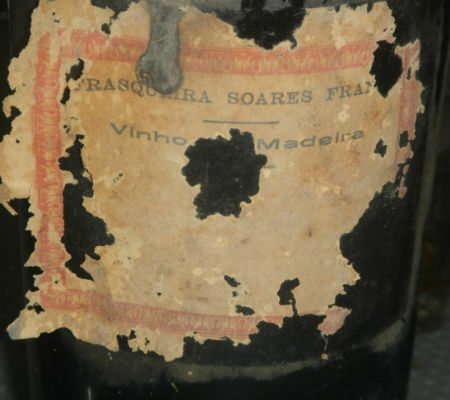 The wines resulting from the partnership with Trienal do Alentejo are more recent. The first release is the Arundel 36 2009, which results from a wine that was literally forgotten in the cellar and originated a the small amount of about 500 bottles, aged for 36 months in barrel. A serious and fresh set showing a mix of sweet fruit with red blueberry notes, strawberries and blackberries, a slightly floral fragrance with spice in the background. Great set harmony with a good mouth passage. A more open profile and less concentrated but creasing the entire palate with fruit flavors and spices. Ends broad, with a slight dryness in the gastronomic side that is the hallmark of this house. The second edition goes by the name Arundel T & T 2012, a blend based on the grape varieties of the previous two wines that aged in barrel for 12 months. For the most curious T&T are the initials of the Trienal and Terranagro (production company of Joaquim Arnaud’s wines). Another example that combines finesse, freshness and fruit. In this case the fruit is less present giving place to a more floral and spiced side. The red and acid fruit, with tones of raspberries and blueberries appears in the background next to a light earthy/graphite. Mouth full of flavor, a slight dryness in the background, much cocoa, tobacco leaf and fruit. Culminating with the Arundel Great 2008, 400 bottles of a wine that aged 12 months in barrel and another 24 months in bottle. A 100% blend of Alicante Bouschet. A sweeping red right from the first contact, such is the finesse and lasciviousness that it displays. Pure class, great harmony of an adult wine and ready to provide pleasure, very fragrant with juicy and fresh fruit on a huge quality bouquet where everything shows up well-defined. Not nipped by time at all, showing that it has managed to evolve for the better side. Like all of this producer’s wines shows a good Alentejo character, asks for table and shines brightly alongside some wrapped partridges.